I was in Ely this president's day weekend. Chelsey and I met up with some friends to rent a cabin and go cross country skiing. 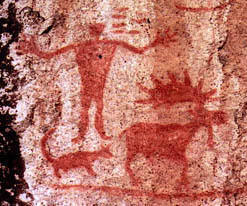 The first day we went into Hegman lake and saw the pictographs. We had a lot of fun guessing what they mean. The main debate in our group seemed to be whether it was someone bragging about a moose they saw or whether it was a bored person doing a drawing. I guess we'll never know. The next night we found wolf tracks outside the sauna. If I had looked out the sauna window I would have seen a big wolf from about six feet away. Unfortunately I was choking on smoke as I was trying to get some really bad wood to light in the stove. Oh well. It was a beautiful trip.